Originally published under the title "Iran Puts Finishing Touches on Its Land Bridge to the Golan." Abu Kamal is the last link in the Iranian land bridge from the Iraq-Iran border to the Mediterranean. In the east of Syria, the so-called race to Abu Kamal between the US-supported Syrian Democratic Forces and the forces of Iran, the Assad regime and Russia appears to be close to conclusion – in the latter's favor. Regime forces moved into the town last Thursday. They were then expelled by an unexpected Islamic State counterattack this week, and have now retreated to positions about two kilometers outside of Abu Kamal. 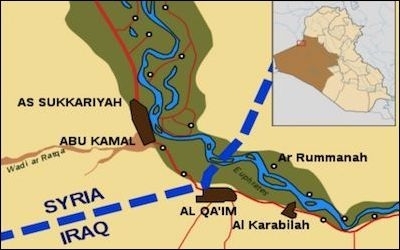 Abu Kamal is the last link in the much-discussed Iranian "land bridge" from the Iraq-Iran border to the Mediterranean Sea and the border with Israel. Control of the border crossing at al-Qaim/Abu Kamal and of the roads leading west from it will enable the Iran-led regional alliance to transport fighters and weaponry in both directions, according to choice. It will mean that in a future confrontation with Hezbollah, Israel could see its enemies reinforced by supplies and volunteers from among other Iranian clients, in precisely the way that took place with such effect in the Syrian war. Hezbollah can now be reinforced by Iran's other regional clients in a future conflict with Israel. Of course, such efforts would not be invulnerable to Israeli attentions from the air, and would not confer an irreversible advantage on the Iranian side. But given the Iranian weakness in aviation, the land bridge would vastly increase the options and abilities of the Iranian side. It is worth noting in this regard that in recent days Iraqi Shi'a militias crossed the border by land for the first time in the Syrian war, to join the battle against Islamic State in the Abu Kamal area. The land bridge would convey economic advantages as well as strategic ones. It would allow for the transport of Iraqi oil to regime-controlled Syria, bypassing the area currently controlled by the SDF. This will be important in the reconstruction period ahead, regardless of the precise lines of control within Syria. The imminent conclusion of conventional operations against the last remnants of Islamic State in eastern Syria will in turn bring with it a moment of crucial decision for the United States. A central facet of events in recent months in Syria has been the absence of a clear US strategy. The de facto relationship between US air power and special forces and the Kurdish YPG has proved to be a successful military partnership. This force, not the Assad/Iran/Russia side, is responsible for the greater part of the victory against Islamic State in Syria. Indeed, the regime side's belated push east came precisely to limit the territorial gains of the US-backed SDF. But throughout, there has been a clear discrepancy between the military support afforded to the SDF and the complete absence of recognition by the US or any other Western power of the broader Kurdish-led political project in northern Syria. The Federation of Northern Syria, declared by the Syrian Kurdish leadership on March 17, 2016, indeed lacks the recognition of any other country. Officially speaking, the reason for US involvement in eastern Syria has been the war against Islamic State. Neither more nor less. At the same time, there is evidence of extensive US military construction in Kurdish-controlled eastern Syria. Airstrips and bases have been built in Rumeilan, Manbij and Kobani. 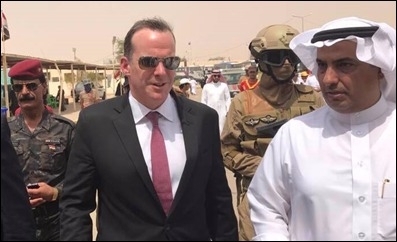 The powerful Saudi official Thamer al-Sabhan visited SDF-controlled eastern Syria in late October, accompanied by Brett McGurk, US special envoy to the coalition against Islamic State. The purpose of the visit, according to a Reuters report, was to discuss the reconstruction of Raqqa city. All these snippets might suggest that the US has longer-term intentions in eastern Syria and does not mean to merely abandon its erstwhile allies, once the task of destroying the Islamic State "caliphate" is done. A statement by US Defense Secretary James Mattis this week supported this impression. He noted that the US does not intend to "walk away right now before the Geneva process has traction," and would fight Islamic State "for as long as they want to fight," in order to prevent the emergence of "ISIS 2.0." If the US does decide to stay in eastern Syria, it will need to consider the logistics of how to supply this area, against the wishes of all neighboring entities. 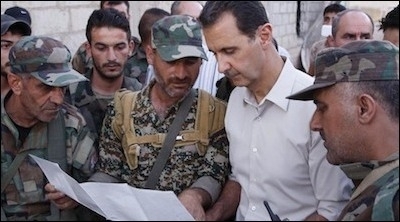 The Assad regime has made clear that once Islamic State is defeated, it intends to reunify the entire area of Syria. Turkey is opposed to the Syrian Kurdish enclave because of its links to the PKK. And the Abadi government in Baghdad, while happy to receive US weaponry and training, is in fact the ally of Assad and Iran, and as such also opposes the US-aligned Syrian Kurds. The Assad regime has made clear that it intends to reunify the entire area of Syria once Islamic State is defeated. Up until last month, the pro-US Iraqi Kurds controlled two border crossings to their Syrian brethren. But these were lost to the Iraqis and the Shi'a militias in the military action that followed the Iraqi Kurdish independence referendum of September 25. So, a difficult decision awaits the US. Much will depend on the choice made. But in any event, since the conquest of Abu Kamal by Iran and its allies looks inevitable, even if the US chooses to stick with its current allies in eastern Syria, this will not prevent the Iranian land bridge from coming into being. It is already a fait accompli. From an Israeli point of view, this is a cause for concern. Israel's focus is not related mainly to the Syria-Iraqi border, of course, but to the southwesternmost part of the corridor – where it is set to nudge up against the Quneitra crossing and the Israeli-controlled part of the Golan Heights. The joint statement by President Donald Trump and Russian President Vladimir Putin released on November 10 fails, in Jerusalem's view, to adequately address the issue of Iranian and Iran-supported forces close to Israel's border. The statement issues no timetable for the withdrawal of these forces. And Russian Foreign Minister Sergei Lavrov was quoted on Tuesday as dismissing any notion that Russia had promised the withdrawal of Iranian groups from Syria. It is unlikely, in any case, that Russia could bring about the unilateral withdrawal of its Iranian ally from its hard-won corridor. Iran is not dependent on Russia and pursues its own agenda in Syria. Israel has stated clearly that it will continue to act to ensure its security. What this means, in practice, is that as the Iranians continue to solidify and extend their gains in Syria, so the likelihood of direct friction between this project and Israel's enforcement of redlines will grow. Tehran is presently pressing forward. The key issue of the extent to which the US will continue to be a player in this arena is set to be resolved in the weeks ahead. But whatever the US decision, the taking of the dusty, al-Qaim/Abu Kamal crossing is set to turn Iran's land bridge, from Tehran to Quneitra, from an objective into an established fact.